There are many elements to look at when deciding what type of leader you want to be. When searching on Google there are a large variety of different articles on Leadership Skills. Despite all of these, many questions are still left unanswered. This Ultimate Guide aims to answer all of those questions. Before setting off on developing your skills, it is important that you understand the in’s and out’s of leadership. In our Ultimate Guide to People Management Skills, we look at the differences between a leader and a manager. 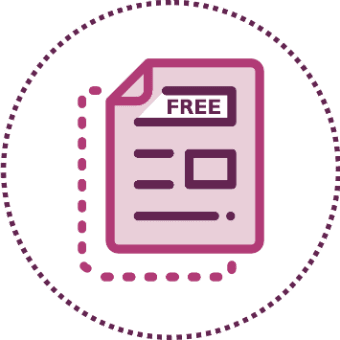 In this Ultimate Guide, we aim to help you navigate this huge topic and give you insight into the qualities, pitfalls and different approaches. 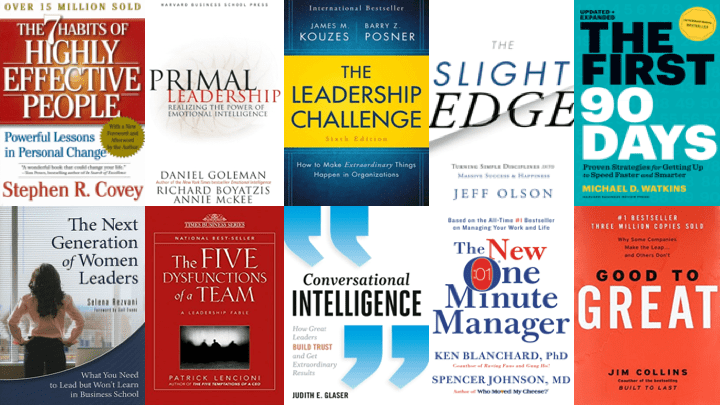 Furthermore, we will advise you on the best reading material to further develop your knowledge of Leadership. According to the Oxford Dictionary, the definition of leadership is; “The action of leading a group of people or an organisation” or “The state or position of being a leader”. However, in the 21st Century, this seems a bit outdated. For instance, people are now encouraged to be leaders at every level rather than just being in a position of leadership. To demonstrate, The Charted Institute of Personnel and Development (CIPD) agrees that it is important to invest in your people and create the right environment where leaders can develop. Similarly, The CIPD encourages training employees to meet their objectives and motivate others to do the same. This means enabling leaders by making sure systems and processes support their development. In the modern business world, leadership skills relate to the effective allocation of resources in order to best meet the mission, the overall objective of the organisation. The skill part of leadership comes into how this is achieved. Effective leadership is a balancing act between having a long-term vision and strategy for the future, and the soft skills to inspire, delegate, empower and communicate to bring the most important part of any organisation, the people, along with us. Ultimately, it’s about encouraging people to be great! 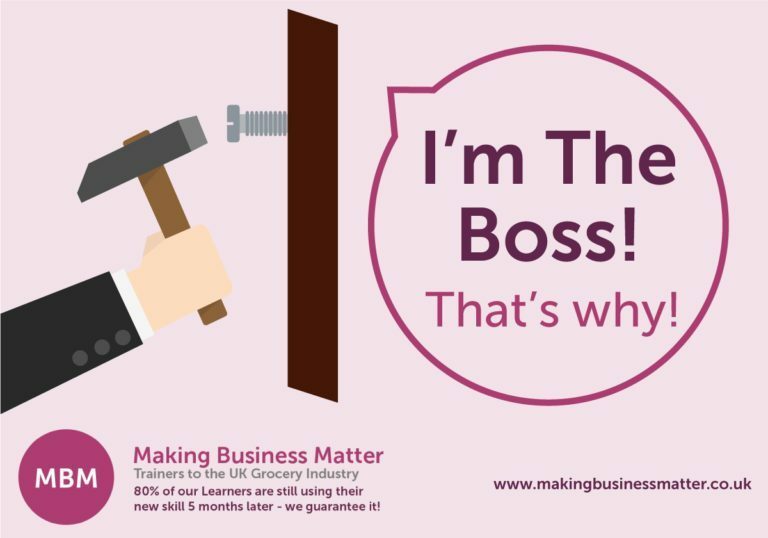 Over the last 10 years, the internet has been populated with more and more posts about the difference between being a ‘boss’ and being a ‘leader’. This change is an interesting area to explore as the workplace moves into a more millennial-focused workforce (by 2025 – 75% of the workforce will be millennials). The millennial generation has grown up with more freedom and less authority. Having grown up in a connected society allowing more freedom and individual expression than ever before, millennials have subsequently developed into workers that do not like rigid rules. Consequently, they will not follow a manager just because they are told to. This means that leaders need to earn the respect of their people. Additionally, they need to constantly develop their skill set to make sure they are focusing on what is important to the workforce. Typically, most millennials want the freedom to be creative, a great work-life balance, a strong company culture and to be connected to people all of the time. Is a Leader Born or Bred? This is a question that is asked often in businesses. The answer is never simple. Some people are born with a greater ability to get people to listen to them or follow their ideas. Without a doubt, the skills it takes to be a great leader can be learnt during life. Some people, however, just have to work a little harder than others at developing different skills. Psychology Today agrees: The best estimates offered by research is that leadership is about one-third born and two-thirds made. Being able to accurately size up social situations and understand social processes does, without a doubt, make it easier to learn how to be a good leader. How you make people feel. Being able to help every individual shine. How you bring everyone with you to achieve a common goal. Knowing that two-thirds of being a leader is learnt, anyone wanting to be a leader should be putting together a list of everything they need to develop. Once you know what you need, it’s much easier to start to gain these skills. 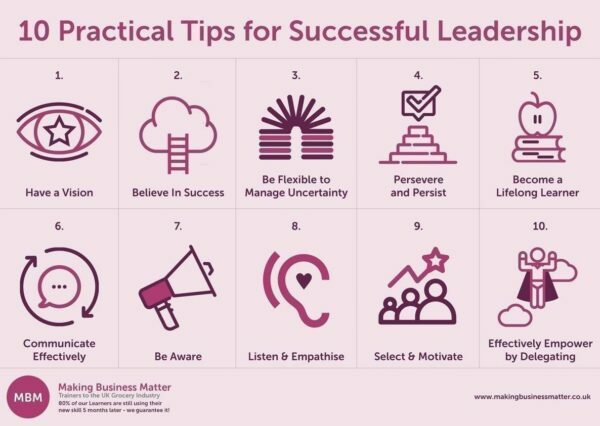 The list below pulls together the areas that need to be fine-tuned in order to be a great leader. SMART goals are critical to their team: as a result, any leader needs to be able to set goals and, importantly, then help the team achieve them. In order to build trust in a team, you need to be accountable. Any team should know that their leader has their best interests at heart and will protect them from dangers. Consequently, if a team feel they can trust and depend on their leader they will perform better. Leadership needs to be inclusive; therefore a leader needs to have the correct body language and tone to make people feel they can approach them to talk about anything. In fact, a good leader knows they are only as strong as the team they have around them. An open leadership style of ‘what you see is what you get’, coupled with all the other skills of leadership undoubtedly makes it really easy for people to follow an authentic leader. Nelson Mandela said – ‘I learned that courage was not the absence of fear, but the triumph over it. The brave man is not he who does not feel afraid, but he who conquers that fear’. A whole nation followed Mandela because he had the courage to do what others could not dream of. A leader needs to be willing to take the first step and then encourage the team to come with them. As a leader, you have the ability to be generous in more than one way. By giving a team member the benefit of the doubt and supporting people to grow by giving them a chance to shine. Moreover, a generous leader will never take credit for anything a team member thought up or work completed by someone else. They will shine the spotlight where it should be shone. An essential trait of effective leadership, that everyone is aware of, is communication skills. Without a doubt, having the ability to get a point across effectively, so that it is received as you intended, is essential. Leaders need to be positive and upbeat, and you need to encourage this in other people as well. Moreover, having an infectious positive attitude is great because a team needs that force of positive energy to lift them up, particularly when working through something tough. Although you should be passionate about what you do, and the company you work for, as a great leader you need to be passionate about people. Consequently, you should thrive on developing people to realise their full potential. To problem solve you need to be creative and analytical. Being a great leader means testing every option before deciding something is not achievable. For that reason, encouraging others to come up with solutions can help change an organisation into an environment to breed leaders. As a great leader you are inclusive of your team, but also know that ultimately you are responsible for the team. A great leader will explain to their team what has not worked and looked for better practices in the future. However, they would never tell Senior Leaders that it was someone else’s idea that got the team into a difficult spot. Leaders will stand up for the team and take responsibility at the right times. Awareness of your own feelings and the way you make other people feel is critical for a leader. In fact, to influence and encourage people, you need to be able to show our own strengths and weaknesses. Thus, having humility as a leader is the easiest way to get people to follow you. As a leader, you need to be able to manage your tasks, time and self, because self-drive and motivation are key to success. 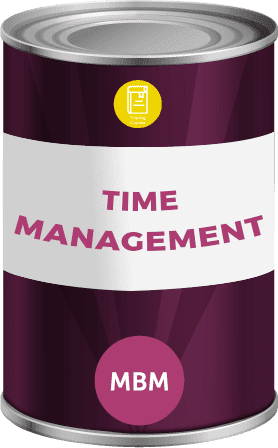 Moreover, having the ability to self-manage means you can think outside of the box, use your time effectively, and develop ideas into plans and actions. Learn some tips on time management skills by reading our Ultimate Guide. Strategic leadership is all about influencing skills and being able to influence people to make decisions that are best for the business. This is about reflecting on situations to create links that others fail to see. Those which will benefit the team. As a leader, you should always be working towards a better future for your people, organisation and customers. Believing you can always make a difference is a great trait for a leader because it means you will keep driving the business forward. In fact, when a leader feels they have achieved everything that they can, this becomes a dangerous mindset and starts to set people up for failure. Leading a team is about Trust, Respect and Integrity. A big point to know before you start looking at leadership styles is that there isn’t a best or perfect style. Many different leadership models and styles are used. They all have their time and place, along with strengths and weaknesses. From Kurt Lewin’s ‘leadership climates’ research in the 1930s to transformational leadership, which is likely to be the most commonly used method of leadership in the 21st Century, a number of popular leadership paradigms will be introduced. Each individual leader can take the best aspects to build their own style. An Autocratic leader can make decisions fast to move things forward. This can be beneficial until they stop encouraging their team to give input. Without any input, the team stops being part of the journey and doesn’t work together. Examples of Autocratic leaders from history would be, Queen Elizabeth I, Genghis Khan, Adolf Hitler, and King Henry III. Each took a very dictatorial approach to leadership and their teams (or subordinates) had no input into outcomes. A Democratic leader makes the final decision but includes the whole team in getting to the conclusion. Furthermore, they will take on board everyone’s ideas and have a highly motivated team. Being a democratic leader could, however, slow the decision-making process. Examples of Democratic leaders would be Thomas Jefferson, George Washington, Barack Obama and Nelson Mandela. These presidents all empowered their teams (or staff) to give ideas and solutions. A Laissez-Faire leader provides the team with support when asked, but otherwise, does not get involved. When surrounded by good workers this can be a highly effective management style. However, when workers can’t self-manage or manage their time effectively, this can be a recipe for disaster. A Laissez-Faire leader can seem out of control. An example of a Laissez-Faire leader from history would be Mahatma Gandhi. He never labelled himself a leader, he brought people together as they shared a common goal, but he never directed people in what they had to do. 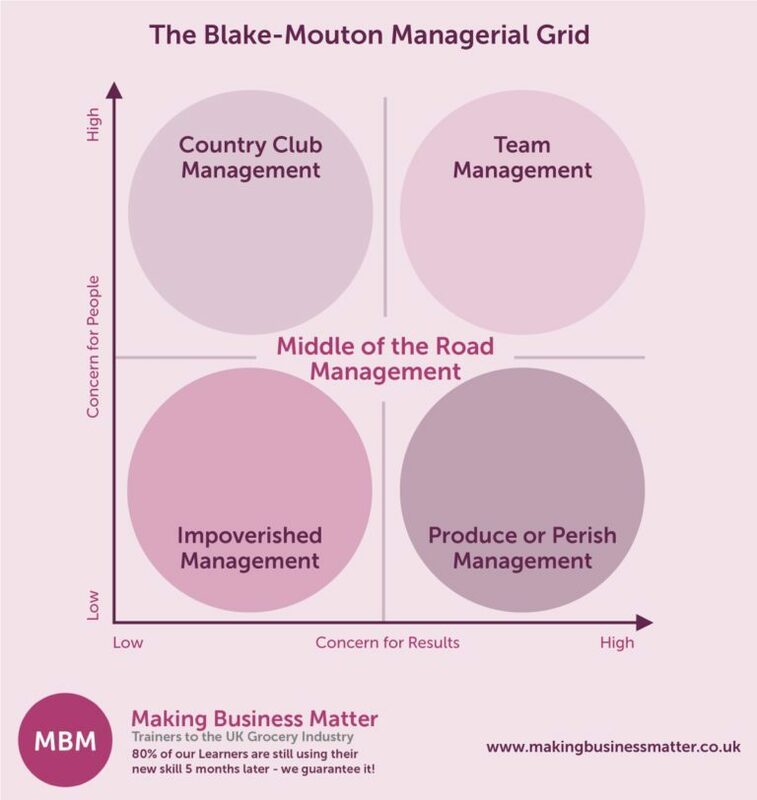 The managerial grid model was pioneered by Robert R. Blake and Jane Mouton in 1964. 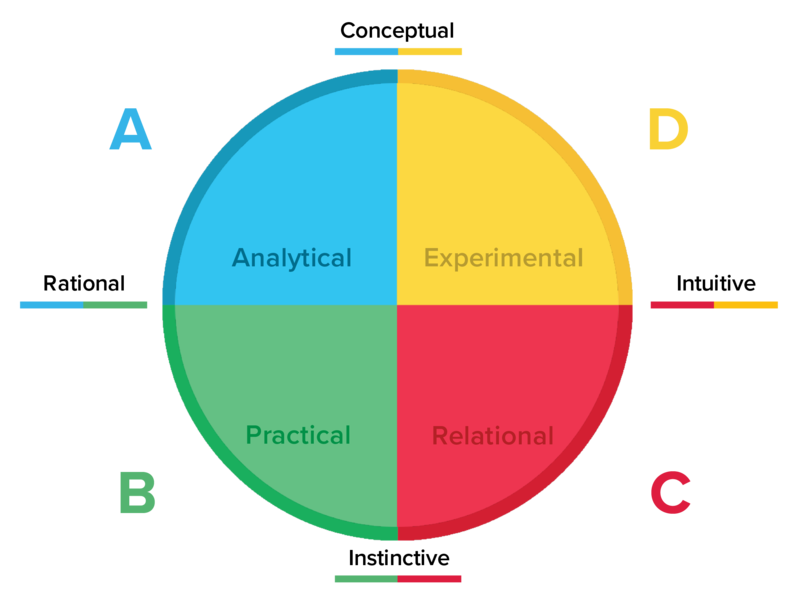 The model identifies five styles of leadership around two areas; concern for people and the concern for production (or results as seen in the grid below). The model argues that the optimal leadership style is based on Theory Y of motivation, which assumes that people are internally motivated and thrive in democratic environments. Impoverished Management – Low Results/Low People. A low focus on people and task. This will likely be a disorganised leader at best. Produce-or-Perish Management – High Results/Low People. Always focused on results. This leader might see punishment as a good motivator and likewise see their team as a means to an end. Middle-of-the-Road Management – Medium Results/Medium People. A leader that compromises everything to try to achieve everything is likely to end up with nothing. This middle of the road approach proves this. Country Club Management – High People/Low Results. This leader has highly motivated people that normally lack direction and control. This will be a great working environment, but won’t produce results. Team Management – High Production/High People. According to the Blake Mouton model, this was the most effective way to manage in the 1930’s, and we still agree in the 21st Century. This approach is about balancing the passion for people and the work that we do to achieve team orientated results on an ongoing basis. James McGregor Burns introduced the concept of Transformational Leadership in 1978 and later in 1985. Bernard M. Bass extended the concept to what we know today. The main premise of transformational leadership is all about loyalty, trust and inspiring their people. Transformational leadership is said to be the most used style of leadership in businesses today. This is about leaders having visionary ideas and building trust with people to get them onboard with making the vision become a reality. A leader working at this level needs to take time to reflect and develop themselves. As a result of the generational change, we need to constantly adapt how we influence people. Saying that the integrity at the core of this leader would never change. The visionary leader is inspiring. They will set a goal for the team but not dictate how they get there. Instead, they encourage the team to come up with their own ideas. 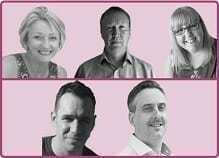 The coaching leader will work hard to link the team development with the future needs of the business. Thus, this style is normally very empathetic and encouraging. The affiliate leader is all about the people, harmony in the team and exhibiting strong conflict resolution skills. This can help a team get through a stressful time, for example. The democratic leader has a very inclusive way of working. They focus on asking questions and listening more to the team’s ideas than just telling them what to do. The pacesetting leader is all about results; happy to get their hands dirty to help the team achieve goals. Consequently, they have very high standards for their teams. The commanding leader is the same as the autocratic leader of the Lewin Theory. They are very direct and use fear as a tool to achieve goals. For that reason, they are likely to have a demotivated team. Developed by Kenneth Blanchard and Paul Hersey in the late 1970’s/early 1980s, this refers to leaders having the ability to adapt their leadership styles based on the experience of the employee. As a team grows, a leader should be able to move through each stage of the cycle. Directing will be for new tasks that the employee has no previous skill or knowledge in completing. This will require high directive and low supporting behaviour from the leader, see S1. Coaching will be a task the employee has done with you, but can now be coached through doing alone. 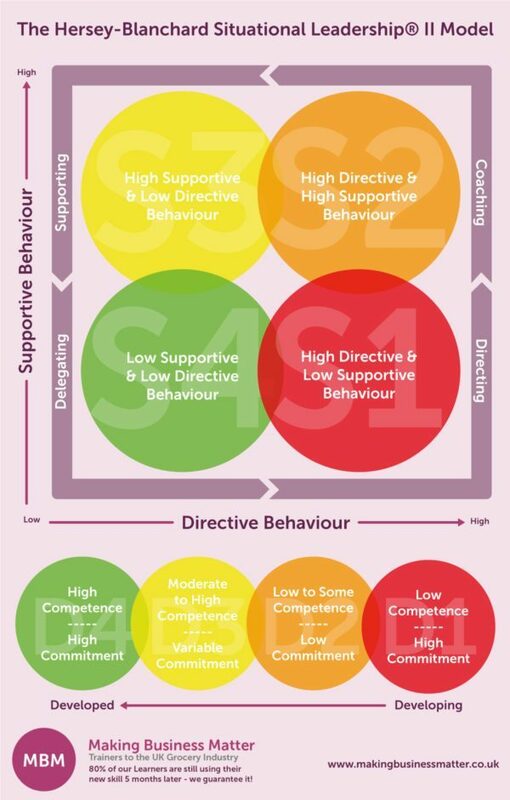 This will require high directive and high supportive behaviour, see S2. Supporting will be a task the employee has been coached through, but can now attempt with limited support. This will require high supporting and low directive behaviour, see S3. Delegating will be a task the employee has completed with support before, and now can just be asked to complete. This should require low supporting and low directive behaviour from the leadership, see S4. In the directing stage, you would need to show them how to do this and explain the information that is needed. In the coaching stage, you would talk them through completing the task and get them to make notes on how to do it unaided. At the supporting stage, you let them complete it alone and be available if they have any questions. Finally, in the delegating stage, you should be able to ask for this report and your team member can produce it without support. Depending on the complexity of the task, you might need to repeat stages before moving on. Bureaucratic Leaders are all about the rules, so naturally, this style only suits certain types of work and is ineffective when creativity and flexibility are critical to success. Servant Leaders are normally individuals who aren’t official leaders in an organisation but have high integrity and people naturally follow them. The danger with this approach, however, is that they will often be looked over for opportunities in more competitive situations. Servant leaders often support everyone else, however, this can be at the expense of their own future development. Leadership styles should be flexible and used in the right situations. One size approach fits all never works. A lot of managers will make the mistake of focusing solely on their people and not on themselves. In order to continue to lead a team well, you need to continually develop your own skills. Managers struggle with thinking of ways to be inspiring, most make a mountain out of a molehill. To be inspiring you need to be passionate, positive and genuine with people. Naturally, that will become contagious. Having the skills to get stakeholders on board is something a lot of managers struggle with. More time needs to be spent on developing these skills. To understand each stakeholder as a person is important so that you can tailor your style to suit them. In order to find out more about different styles of people, you can read our Ultimate Guide to Herrmann Brain Dominance. In his book ‘The Seven Habits of Highly Effective People’, Steven Covey explores the area of trust, using the analogy of a bank account to establish the amount of trust in a given relationship. The idea is that through every interaction with another person, be it socially or at work, we keep an emotional account. Every relationship starts with a balance of zero, with positive and negative interactions monetised as emotional units. Understanding the individual – e.g. listening and showing empathy. Keeping Commitments – e.g. keeping appointments and arriving in a timely manner shows respect. Clarifying expectations – e.g. clearly communicating what is expected and keeping a dialogue so there can be no misunderstandings. Attending to the little things e.g. the small kindnesses that make such a big difference, they will be remembered and help build trust. Showing personal integrity – e.g. demonstrate morality, do what is right and good. Apologising when we make a withdrawal – e.g. when a mistake violates the existing trust, apologising (a deposit) can help mitigate the damage (withdrawal). It is always going to be a fine line for leaders, being passionate about both the business and people, and trying to balance the needs of both. By remembering that every interaction, be it positive or negative, will affect the account balance will help you keep on track. Treating others how you wish to be treated, with thought, respect and consideration, will go a long way to help keep your emotional bank accounts in the black! Like any other person, leaders have good days and bad days. However, for a leader, it is critical that you don’t let the bad days affect the team. Finding ways to motivate oneself is the best way. Setting small milestones to get yourself focused and moving in the right direction is important. This is the biggest pitfall that is seen in businesses. Leaders feel that they need to get it right all of the time and that they need to be liked. Most leaders are fearful of losing their creative edge, their financial stability, and alarmingly, their drive and focus. Fear, however, creates an inability to perform, which as a leader you cannot afford. Being a strong leader means you can confront setbacks, but never give up on the goal. Using skills such as strategic thinking to work through the worst-case scenarios can help deal with fears. Furthermore, having a strong team around you that you are constantly developing can help close any gaps you have yourself. Great leadership requires the skills to be able to effectively manage the challenge of organisational change, so that is transformative for both the organisation and its people. In the video below, Penny Moyle the former CEO of OPP provides some interesting insights into her approach to change management, drawing from her background as a business psychologist. “Don’t let past failures determine what your future success will be. Walt Disney went bankrupt — twice — before finally gaining lasting momentum. The Beatles were rejected from numerous record labels, as was Tom Petty. Thomas Edison failed at creating the light bulb ten thousand times before getting it right! 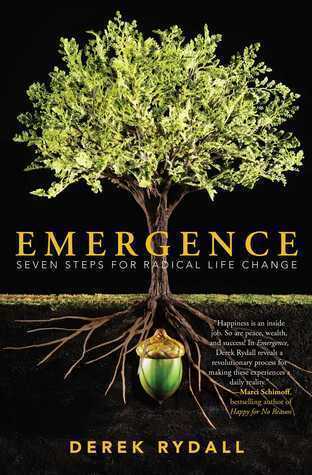 If he used failure as an indicator of his true path, you might be reading this by candlelight.” – Derek Rydall, Emergence: The End of Self Improvement. Every business should understand the importance of leadership training. Selecting the right leadership courses, mixed with on the job development via coaching and mentoring, is critical to developing leaders within an organisation. Increased productivity comes from having a higher knowledge and skill base. Therefore, leaders that continue to learn will always have new ways to approach problems. Retention of people is achieved through how people feel about a business. This is largely down to the individual manager. Nurturing of future leaders is critical to any organisation. This is because when older leaders retire we need to have a succession plan in place. Increased employee engagement comes from employees feeling like they are part of something bigger; a purpose or a team. Consequently, you need to be a strong team leader to build an effective team. Changing the leadership style in the business can be the key to staying ahead of competitors and growing the business’s market share. Without strong leaders all working together effectively it is difficult to achieve. Faster and better decision making will also help to stay ahead of the market. Thus, for this to happen, we need to continue to develop the leaders and help make them confident in their skills. Reduced staff turnover in any organisation is beneficial as the return on investment in training, developing and growing leaders and employees is invaluable. You can view a full list of our training courses available for your leaders here. Executive coaching is where a leader receives one-to-one coaching skills support to further develop and deal with any individual challenges. For the best results, a lot of companies choose to get external coaches to run these sessions. Having an impartial coach can help leaders open up and deal with difficult situations faster. Depending upon the area that is being worked on, coaching plans will run for up to 12 months. They will encompass the setting of, and achievement of, a set goal. The greatest reason companies employ coaches is to increase emotional intelligence in senior leaders and high potential staff. Emotional intelligence is a measure of an individual’s abilities to perceive, understand and manage their emotions and those of others. The growth of emotional intelligence in the workplace followed the publication of science journalist Daniel Goleman’s mixed model (or commercial wing) to the previous scientific research by Peter Salovey and John D. Mayer in the early 1990s. The concept suggests that intelligence encompasses more than simply having a high IQ, and we, in fact, all have multiple intelligences which can determine success in business. When researching the different facets of successful intelligence, psychologist Robert Sternberg identified Emotional Intelligence as a component. Simply put, those that are successful require more than book smarts. Moreover, emotional intelligence ties in with the current leadership trend towards great leaders demonstrating transformative leadership qualities. In essence, to be transformative encompasses the key dimensions of emotional intelligence; self-awareness, self-regulation, empathy, social skills, and self-motivation (as can be seen in the infographic below). As a result, most companies will use emotional intelligence testing when they employ managers. This helps ensure leaders care about their people and the effect they have on them. Consequently, this should ultimately lead to greater workplace cohesion, greater workforce morale, and higher productivity. By understanding your thought preferences, you can achieve a greater appreciation for how you learn, which in turn helps decision making, problem-solving, and communication. How Can HBDI® Support Leaders to be Better? By understanding yourself and your workforce better, you can tailor your communication toward their individual needs. As a leader, you can be dominant in any quadrant. The challenge, however, is working on those less dominant quadrants, and using the strengths of the people in your team to be ‘a whole brain’. You can read more about HBDI ® in our Ultimate Guide. Leadership coaching and development is important to grow your talent and retain your people. Here are 10 practical tips for being an effective leader. They are by no means an exhaustive list but highlight some of the main areas where attention should be focussed for better personal, and in turn, organisational performance and success. Vision inspires confidence and belief in others. A visionary leader is a dreamer, a thinker, someone who constantly faces adversity and triumphs. That is why your belief, drive and unwavering dedication toward an uncertain future goal are infectious for those following. Demonstrate single-mindedness and total belief that there will be no other outcome than success. Never take no for an answer. 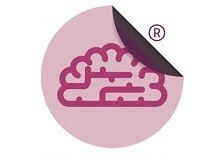 Have unflinching belief in the capability and competencies of the organisation and its people. Flexibility is essential for success. The internal and external organisational environments are constantly changing. A good leader, therefore, needs to adapt and if necessary change the organisation’s strategy, structure and approach. Leadership is not always easy. In favourable and unfavourable times a good leader maintains motivation and drive towards the mission or vision. Never rest on your laurels. A good leader will always look to self-develop to stay ahead of the trends and ensure competitive advantage is sustained. Good leaders are heard and understood, but it is essential to also listen. Listen, and tune in to the organisation and its people, because lots of great strategies have come from within, emerging through a bottom-up approach. An organisation is full of people, like it or not they all have emotions which affect the way in which interactions occur. It is essential, therefore, to demonstrate high emotional intelligence, in the way you understand and manage your emotions and those of others. Understand and share the feelings of fellow organisation members. Speak their language and show that you are a caring leader. Moreover, take the time to get to know everyone, listen to their ideas and concerns, show that their opinions matter. Choose the right people for the right role. Build, control, and continuously develop the team by individual coaching, thus, allowing growth within roles. As a leader, you cannot do everything! Allow team members the autonomy to make correct decisions by delegating. Furthermore, empowering them to be accountable as the owner of a task or self-directed project can be highly motivating. Trust, support, and coaching are however essential. If done correctly it can lead to the growth of the individual, and an increase in overall organisational effectiveness, potentially creating the leaders of tomorrow! At the end of 2016 women made up 60% of junior managers, 40% of middle managers and 20% of senior managers in British businesses. This, therefore, shows that there is still a gap in the higher levels of management for women to fill. With equality being at the forefront of minds, and the recent gender pay gap talks, it is critical for businesses to start developing their high potential female employees. Over the years there have been improvements for women in the workplace and, consequently, they have had more opportunities to climb the career ladder. Currently, in the top FTSE 100 companies, there isn’t a single board that doesn’t have a female member. From the outset, this seems very positive, but actually, this figure fell by 12% from 2016 to 2017. Women are better at listening to understand. More likely to collaborate to resolve issues. Women are seen to be more accessible and easier to talk too. See the personal growth of themselves and their teams as important. Philippa Jones, Chief Executive at Bromford. Dame Carolyn McCall, Chief Executive at easyJet. Sacha Romanovitch, Chief Executive at Grant Thornton UK. Pamela Nicholson, Chief Executive at Enterprise Holdings. Do it, step out of your comfort zone, push yourself a little bit further each day. Dominate the things that scare you and tackle those you didn’t even know you were scared of. Find your fears and conquer them. Believe in yourself and your ability. Confidence is the biggest reason men normally get a leadership role over women. Forget about equality, gender pay gaps and percentages of top female leaders. Focus on being great at your job. Remember, gender is not an excuse not to achieve your goals. “If your actions create a legacy that inspires others to dream more, learn more, do more and become more. 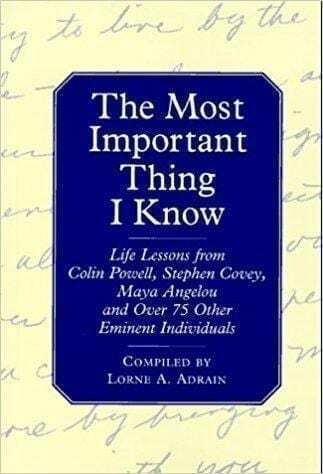 Then, you are an excellent leader.” – Dolly Parton, from The Most Important Thing I Know by Lorne Adrain. Understanding leadership is critical to developing yourself as a future leader. Reminding you to push yourselves to be better every day. Being a leader is about advocating for and encouraging your team. As Richard Branson says, ‘Clients do not come first. Employees come first. If you take care of your employees, they will take care of the clients.’ Be a great leader and people will follow. 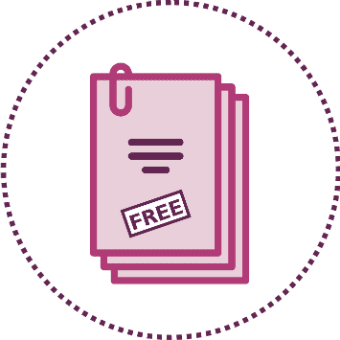 You can find further insight, detailed definitions and clarification of all the key leadership terms mentioned in this guide in our Glossary of Terms. “It is better to lead from behind and to put others in front, especially when you celebrate victory when nice things occur. You take the front line when there is a danger. Then people will appreciate your leadership.” – Nelson Mandela. 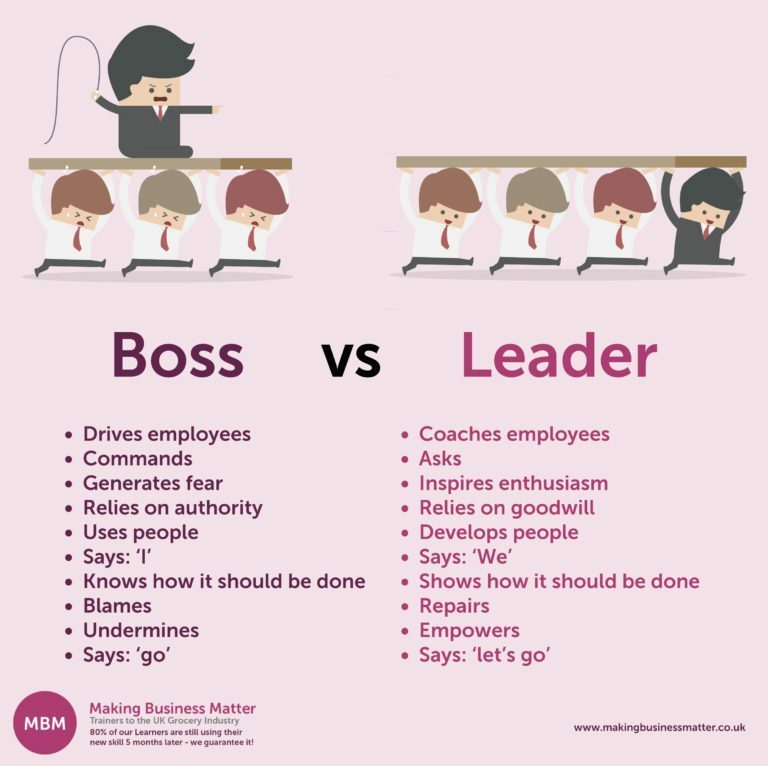 “People ask the difference between a leader and a boss. The leader works in the open, and the boss in covert. The leader leads, and the boss drives.” – Theodore Roosevelt. “Outstanding leaders go out of their way to boost the self-esteem of their personnel. If people believe in themselves, it’s amazing what they can accomplish.” – Sam Walton. “The 7 Habits of Highly Effective People” by Stephen Covey. As mentioned earlier in his theory ‘the emotional bank account’. Covey has 7 principles of being proactive to win-win outcomes, each one helping you develop yourself. 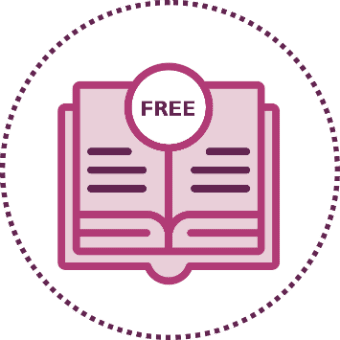 “Primal Leadership: Realising the Power of Emotional Intelligence” by Daniel Goleman, Richard Boyatzis, and Annie McKee. Emotional intelligence is so important in business; this book explains the science behind why. “The Leadership Challenge” by James M. Kouzes and Barry Z. Posner. This 2017 book answers the age-old question; ‘What is leadership?’. “The Slight Edge: Secret to a Successful Life” by Jeff Olson. The basic idea of how thoughts become actions and actions become a habit which creates who you are. A powerful change book. “The First 90 Days” by Michael Watkins. This book will help anyone newly appointed deal with the first 3 months of the new journey they are on. “The Next Generation of Women Leaders: What You Need to Lead but Won’t Learn in Business School” by Selena Rezvani. Rezvani uses the book the capture interviews with successful women about how to successfully climb the ladder. “The Five Dysfunctions of a Team” by Patrick Lencioni. Team building skills at their best. It covers the foundation blocks of building a team. Looking at trust, conflict, commitment, accountability and achieving goals. “Conversational Intelligence: How Great Leaders Build Trust and Get Extraordinary Results” by Judith Glaser. An expert in helping leaders build trust, the book gives practical tools and ideas. “The New One Minute Manager” by Ken Blanchard and Spencer Johnson. This book helps leaders understand how to adapt their current leadership style. “Good to Great: Why Some Companies Make the Leap…and Others Don’t” by Jim Collins. Concludes 1000’s of articles and interviews around why companies succeed or fail. Feel free to get in touch to find out how one of our Leadership Training Courses can help you. Simply fill out the form below, and we will be happy to get back to you with further information. We love hearing the thoughts of our readers so feel free to comment and tell us what you think below. What is your opinion on the different leadership styles? Do you think working up the ranks makes you a better leader? What’s the biggest mistake we make as leaders? Or ask me a question about something you want to know more about.